Tires can withstand a lot, but they're not indestructible. You eventually must replace them. Tires don't biodegrade and many end up in junkyards and cause fires and other environmental hazards. 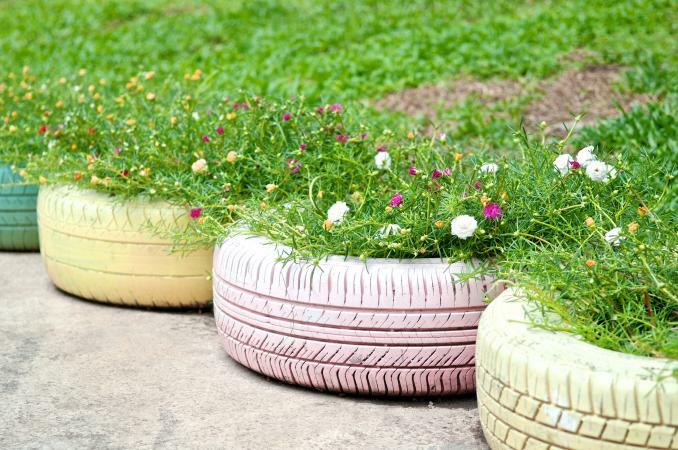 When it's time to trade-in your old tires, there are easy ways to recycle or repurpose them. Locate a local tire recycling facility such as your community's recycling center, solid waste company, or tire dealership. Start by visiting the EPA's scrap tires page. If your state isn't included, search Earth 911's recycling database. Companies such as 1-800-Got-Junk? also haul away and recycle tires for a fee. Check for restrictions on tire sizes and types. Some locations may recycle bike tires but not car or tractor tires. Most states charge a tire recycle fee with each new tire purchase. For instance, Maryland charges 80 cents per tire and California charges $1.75 per tire. There may also be fuel and pickup fees associated with hauling away scrap tires, depending on who you use. Some states offer scrap tire recycling days. For example, Delaware allows residents to recycle up to ten passenger car or light duty truck tires on a specific day at a specific location each year. Proof of residency is required. If you have a pickup truck or other large vehicle, check to see if you can drop off tires directly at the recycling facility. You may even earn money for each tire you deliver. Be sure to contact the facility ahead of time to confirm drop-off hours. Once you've identified a haul-away option that works for you, schedule a pick-up. If you have new tires put on your car at a tire store, you should be able to leave your old ones behind for disposal. But ask what happens to the old ones to make sure they're handled properly. Firestone has implemented The Spent Tire Initiative which recycles or reuses one tire, including your old tires, for every one you buy. And Goodyear works with the Tire Industry Project to make sure so-called end of life tires are managed properly. General Motors has a long history of recycling tires to create new auto parts. Mulch: Tires are shredded to make mulch for beds and play areas that is insulating, long-lasting and less likely to blow away. Rubber asphalt: Tires are shredded, frozen, and pulverized to make crumb rubber then blended into a liquid asphalt mixture. Door mats: Tires are turned into crumb rubber or rubber strips then reprocessed to make door mats and other products. Synthetic turf: Crumb rubber is melted and used to create synthetic turf for athletic playing fields. Although recycling tires is a good way to reduce solid waste, the EPA is investigating the potential health effects of using recycled crumb rubber in synthetic turf playing fields and playgrounds. Planters: Place the tire on its side and fill with soil. Plant an assortment of flowers and greenery. You can also stack different sizes of tires to create a tiered garden. Spray paint the tires for a pop of color. Only plant decorative flowers as chemicals from the tire may leach into edible plants. Tire swings: A long rope and a sturdy tree branch are all you need to make your own tire swing. Consider the size of your kids compared to the size of the tire when choosing this option. Drilling holes in the bottom of the tire lets water drain out, reducing the chances of mosquitoes gathering inside. Sandboxes: Place the tire where you want it and fill it with sand. This works best for larger tractor tires. To keep the sand clean and protected, cover the tire with a thin piece of sanded plywood or a tarp. Table: Stack two or three tires and place a large wooden or plexiglass circle on top to create a table. Support: A tire resting on its side can hold a garbage can or other round container in place. Use the garbage can to hold sporting equipment or other items. Landscape edging: Tires cut into semi-circles make attractive landscape edging. Tree protector: An old tire creates a buffer around a new tree. The tire will protect the tree from mowers, kids and animals that might otherwise run over it. Retaining walls: Tires can take the place of expensive retaining wall bricks on sloped landscapes. Secured them and stack them to create the wall. If you don't like the look, plant a vine that will grow over the tires and disguise them. Dock bumpers: Old tires may be on docks as boat bumpers. Pole stand: Tires work well to hold a pole for tetherball, clotheslines, volleyball nets or any other item that require a pole. Fill the tire with concrete and place the pole in it, allowing it to dry. 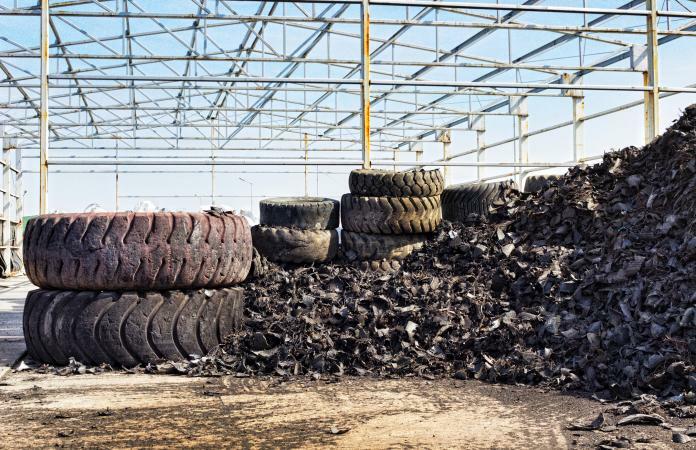 According to the Rubber Manufacturer's Association, over 67 million tires remain in stockpiles in the United States. Thanks to clean-up and recycling efforts, this number has drastically come down from about one billion in 1990. You can keep the positive momentum going by choosing to recycle or repurpose old tires. It helps the environment and may save you from a hefty fine.